We’d love your help. 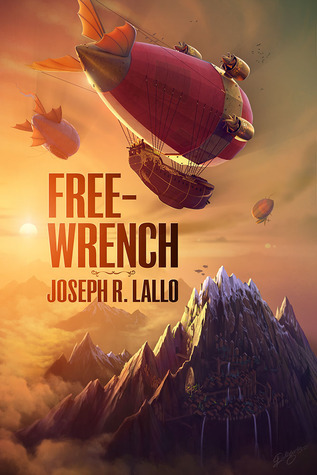 Let us know what’s wrong with this preview of Free-Wrench by Joseph R. Lallo. The islands of Caldara are a shining jewel in a rather bleak world. A terrible calamity in the past had blanketed much of the world with a toxic "fug." Those who survived were forced to take to the mountains and the skies in wondrous airships. Life has since been a struggle, with only the most ruthless and crafty able to survive. To spare themselves the same fate, the Cald The islands of Caldara are a shining jewel in a rather bleak world. A terrible calamity in the past had blanketed much of the world with a toxic "fug." Those who survived were forced to take to the mountains and the skies in wondrous airships. Life has since been a struggle, with only the most ruthless and crafty able to survive. To spare themselves the same fate, the Calderans erected a battery of guns to fend off the airships of the mainland. They isolated themselves from the madness of the world, choosing instead to focus on the pursuits of art and creativity. Few believe the technologically advanced but socially barbarous outsiders have anything to offer. Amanita Graus, though, is hoping that they do. To ask other readers questions about Free-Wrench, please sign up. Free-Wrench is a steampunk fantasy about a girl named Nita going on an adventure to save a family member, by joining a group of rogue but friendly airship pirates/traders as they sail about the fug-wrapped world. It's a classic tale of an old disaster mystery - how and why the world came to be covered with this purple noxious fog and the resulting upheaval of society - blended with strong focus on the mechanical ins and outs of 1850s steam-powered technology. The writing is Very nice little book. The writing is naive but pleasant. Things would not necessarily work out this way in real life, not by a long shot, and there are some obvious cliches, but the action is fast, colorful, the characters are varied and sufficiently interesting if again, rather cliche. More like a computer game campaign than a proper book, but it's quite all right for the first installment in the series, and it does leave enough room for future development and adventure. Simple, enjoyable. I liked the way Joseph tells his story, and the technobabble is also quite all right. The story is quite short, and the resolution almost too straightforward, but that's expected give the lighthearted premise. I like. There shall be no limericks as the limerick king is resting. Pretty entertaining romp through the steam-powered airship-filled skies. Not perfect, but fun. I just loved this book, in every way imaginable. I'm pretty stingy with my five stars, but this one made me a very happy woman. I had the paperback copy bought for me as a gift, and I was kind of spellbound as soon as I read the back cover. I mean, Steampunk AND a STRONG FEMALE PROTAGONIST? I thought this would make for a rather grand read. The story follows a girl called Nita, and her place of work involves keeping the steamworks running. Even though I NEVER use the term "Man's work"as I simply I just loved this book, in every way imaginable. I'm pretty stingy with my five stars, but this one made me a very happy woman. The story follows a girl called Nita, and her place of work involves keeping the steamworks running. Even though I NEVER use the term "Man's work"as I simply don't believe such work exists, Nita does seem to work in an all male environment. She thrives in her work, has no fear and loves getting her hands dirty. She reminds me of myself in some ways. Without ruining too much of the storyline, Free-Wrench is based around the adventures Nita and her crew have on a ship called The Wind breaker. While this story was an introduction to those things, it was also so much more than that. There was a rather moving and remarkable story to be told, and there were moments of danger, threat and sheer poignancy. As for the Steampunk side of things, I just love Steampunk. I enjoyed the sheer depth that Lallo went into when describing the gears and taking control of the steam. I think it's absolutely fascinating. Now this is over, I'm hungry to read more about Nita and her adventures aboard The Wind Breaker! There are two types of Steampunk–though like many things the genre is a spectrum–the ones focused on Victorian society and the ones all about the machines. I love both for very different reasons, but my favorite has to be the stories where gears are turned and steam is controlled. Free-Wrench, which should come as no surprise considering the name, is very much the second type. Aminita Graus, who goes by Nita, is something of an anomaly in her talented, artistic family. While they create great works of art and music, she helps keep the steamworks running, a dirty, dangerous job that produces none of the beauty their culture is founded on. The story begins in the middle of a disaster, clearly demonstrating the type of person Nita is. I’ll admit to finding the fast-paced start a bit slow simply because I could not see the shape of the story, leaving me no way to anticipate what would come next or tell what the book was really about. Which is not to say I didn’t enjoy the glimpse into the world or the interesting characters. The last is what kept me reading beyond the initial crisis, a fact I am thrilled with. Everything I learned about Nita in that bridging conflict comes into play as she discovers an opportunity to help her dying mother and takes it with little thought to the consequences. It’s the same as when she charges toward the problem during the beginning crisis when any reasonable person would have been looking for cover. She’s impulsive, focused, and willing to do whatever it takes to achieve her aims. Nita recognizes the existence of consequences. She doesn’t act so in blissful ignorance. No, she’s just willing to accept what will happen next as long as she gets the results she’s seeking, at least when she doesn’t believe she can get away with it. There are a ton of wonderful characters from Lil and Coop who are eager, willing, and none-too-smart, to Captain Mack, Gunner, even Drew, her coworker at the steamworks, as well as many more. The description is rich (though on occasion a bit heavy for me), the mechanics are viable and clever, and the world is well thought out. It surprises me not at all to learn readers of this book demanded more. While Free-Wrench is clearly an introduction of the world and the crew of the Wind Breaker, it serves much more than that in providing a strong, moving story with moments of danger, very real threats, well-seeded espionage (I figured it out early, but it didn’t spoil how the characters remained ignorant because it still made sense), and both comradery and betrayal. This is my sweet spot between earnest if not exactly legit characters and a grand adventure that requires them to pull out all the stops to achieve what they set out to do. The world is harsh and hard, but the people don’t have to let that define them. I read this after winning a set of the SF/F NaNoWriMo StoryBundle. As it stands, this book is very enjoyable, but not without flaws. It's fast-paced and generally light-hearted, with a hopelessly optimistic (and endlessly competent) heroine who joins the crew of a merchant airship. (Bonus points for having a female engineer as the lead). It's an airship because it's steampunk, but basically the story would play out the same in the Age of Sail if the protagonist knew something about sails instead I read this after winning a set of the SF/F NaNoWriMo StoryBundle. As it stands, this book is very enjoyable, but not without flaws. It's fast-paced and generally light-hearted, with a hopelessly optimistic (and endlessly competent) heroine who joins the crew of a merchant airship. (Bonus points for having a female engineer as the lead). It's an airship because it's steampunk, but basically the story would play out the same in the Age of Sail if the protagonist knew something about sails instead of steam. It's a lot of fun to read only so long as you don't allow yourself to think about it. I read for escapism and can still give 5 stars for that, but I want to warn readers who hate "fridge logic" problems. The major problem is that the setting is underdeveloped. It's obvious that the author knows more about the setting than we ever learn. In fact, we learn the most about the heroine's homeland, which she promptly leaves and returns to only for the epilogue. The world is apparently earthlike, except most of the lowlands are covered in "fug", a toxic purple fog inhabited by mutant "fug-folk" or "fuggers". "Fug" was as poor a name for this substance as you can imagine, given its near-homophone. Anyway, most of the human societies (excepting the heroine's isolationist nation) seem deeply dysfunctional and jealous of the people stuck in the fog, who have inexplicably developed much better technology than those living in the sunlight. I think the world could be self-consistent but we don't get enough worldbuilding to know. I'd love another couple chapters' worth of material interspersed explaining the history of this world. A couple of events happen that conspire to change her life forever. Her mother has an illness which can’ I’ve had this book on my TBR list for a while and I thought it was about time I gave the author my attention. I’m very glad I did. Finally! A teenage female protagonist who has more on her mind than boys! Free-Wrench was a refreshing change from the drama queens and hormone-driven young women that seem to populate fantasy these days. Nita, the main character, is in search of a life with purpose. She leaves her sheltered island home in search of a cure for her dying mother. What she finds is a wide and richly varied world filled with possibilities and risks. She learns some hard lessons on her journey, but she handles her mis Finally! A teenage female protagonist who has more on her mind than boys! Free-Wrench was a refreshing change from the drama queens and hormone-driven young women that seem to populate fantasy these days. Nita, the main character, is in search of a life with purpose. She leaves her sheltered island home in search of a cure for her dying mother. What she finds is a wide and richly varied world filled with possibilities and risks. She learns some hard lessons on her journey, but she handles her mistakes with grace. She's accompanied by an interesting supporting cast. The setting is described in enough detail that I could see it in my mind, but not so over-blown that the story bogged down in too much detail. The plot races along with difficult obstacles and believable escapes. Quite good, and a free Kindle book, at least as of this writing. his review is for the Kindle edition ebook. Excitement, action, family, and circumstances out of control all come together to create a terrific story. An isolated by choice country, Caldera was a chain of volcanoes. Most of the citizens were artists, a few had to work steam plants, for the volcanoes kindly provided heat and steam for the entire country. Amanita Graus was unique among steam workers, being female. However, s his review is for the Kindle edition ebook. An isolated by choice country, Caldera was a chain of volcanoes. Most of the citizens were artists, a few had to work steam plants, for the volcanoes kindly provided heat and steam for the entire country. Amanita Graus was unique among steam workers, being female. However, she was very good at her job. A chance to save her mother's life meant breaking laws and customs, even venturing into an unknown world. Would she survive and return? I am thrilled to see a strong female hero in this story. While this hero may not always make the best decisions, she is not reduced to tears when nothing goes quite right. I really like that Nita is able to overcome the odds and show strength when needed. The fact that she is absolutely sure of herself under pressure makes her a hero. Joseph Lallo set out to write a steampunk novel in 30 days of NaNoWriMo (National Novel Writing Month). In my opinion, he succeeded. This is the type of novel that really shows what can be done with determination and patience. As I read this story, it grabbed my attention and hung on. I hated to put the book down, it drew me right in to the story. I would recommend this book to those who read science fiction. It is a good story, with fast-paced action. I have found this author writes very good books, and have read several of his stories already. I will continue to read his books, as long as he is willing to continue writing them. StoryBundle will be the source for this book, for a limited time, starting May 14, 2014. StoryBundle allows the reader to purchase a group of books in a bundle, and name the price they are willing to pay for those books. This bundle will consist of NaNoWriMo novels, at your price. The bundle is only available for 14 days. I have purchased several of these bundles, and have never been disappointed. I finished the book without much difficulty, though there were some awkward moments. Some of the dialogue felt forced, and a lot of the prose seemed to run off a LOT of telling. The plot was eh, overall and for the most part I was intrigued about the world more-so than what was happening. However, I enjoyed the protagonist and many of the other characters (Lil especially) and was very pleased to note that there wasn't a single romance! It was action driven and overall wasn't all that bad. I enjo I finished the book without much difficulty, though there were some awkward moments. Some of the dialogue felt forced, and a lot of the prose seemed to run off a LOT of telling. The plot was eh, overall and for the most part I was intrigued about the world more-so than what was happening. The book Free Wrench is about a girl doing a mans work. In her city the practice of firms arts is praised over dirty work. She then starts to trade with black marketers from the outsides of the city walls. My favorite part is when she uses all of her knowledge to fix the wedged valve that could have destroyed the whole mountain with everyone in it. I would recommend this book to anyone who enjoys a characters self thought and every day thrillers. This was my first experience with steampunk. It was a pretty wild ride I will definitely give another one a go! I hope this is indicative of the genre. Very enjoyable! First time I've read anything in the steam punk genre and thought it had a great pirate high seas vibe to it. Would recommend. This is an excellent novel! I'm impressed with the quality since it was written as part of NaNoWriMo. I'd say, if you're a fan of the TV show Firefly, then you'll probably love this book. Steampunk is rapidly becoming one of my favorite genres -- despite the limited-sounding description of the genre (science fiction that incorporates technology and aesthetics from an antiquated era, such as Victorian England or the Wild West of the US), it's one that's ripe for exploration and experimentation. I've found some wonderful favorite series in the genre, such as Cherie Priest's "Clockwork Century" and Gail Carriger's "Parasol Protectorate" and "Finishing School" series. But sadly, it c Steampunk is rapidly becoming one of my favorite genres -- despite the limited-sounding description of the genre (science fiction that incorporates technology and aesthetics from an antiquated era, such as Victorian England or the Wild West of the US), it's one that's ripe for exploration and experimentation. I've found some wonderful favorite series in the genre, such as Cherie Priest's "Clockwork Century" and Gail Carriger's "Parasol Protectorate" and "Finishing School" series. But sadly, it can also be something of a "hack" genre, where someone falls back on the steampunk trappings to interest the reader and ends up neglecting important things such as plot and characters. Joseph Lallo's "Free-Wrench," to my delight, doesn't fall into this trap. Not only does he give us a well-done heroine and a slew of fun side characters, but his setting, while still steampunk in nature, is unique and fascinating. Most steampunk takes place in Victorian England or, less commonly, the frontier days of American history. It's a treat to find a steampunk novel set in an original location, one that nonetheless follows a set logic and makes sense. Creating a new setting is all well and good, but even the most whimsical and fantastic settings need to follow some sort of internal logic, and thankfully Joseph Lallo's world of the fug is well-constructed and compelling. I hope to see it explored further in future books, as the glimpses we got here were tantalizing. I especially liked the heroine, Nita. She's a determined soul with her own strengths and weaknesses, and with the drive to set out to solve a problem herself instead of relying on another to do it for her. And while there were times I wanted to slap the character upside the head when she did something stupid, I actually liked that -- no one is perfect, and a character that never makes mistakes is boring. And it's nice to see a heroine actually see real consequences for breaking the rules, instead of getting off scot-free. The minor characters are a fun bunch as well, from the gruff captain to the brother-sister duo who help run the ship to the trigger-happy gunner. Even the ship's mascot, a creature named Wink, is more than just an animal and shows his own personality. The book moves along at a steady clip, never lagging or feeling rushed. Action scenes are well-done and downright exciting, and while the prose can be fairly workmanlike, there are some good descriptions throughout as well. And one of the best things I appreciate about this book -- unlike a lot of Kindle freebies or first books in a series, it doesn't end on a cliffhanger. I hate it when the first book in a series ends without resolving anything, and I'm a firm believer in providing some sort of closure in a book, even if the main plot isn't resolved yet. "Free-Wrench" certainly leaves the door open for future adventures, but it can stand nicely on its own as well and doesn't force you to buy the next book to see how things end. There's been a few Steampunk books this year that I've tried getting into and they just didn't work for various reasons. Free Wrench isn't one of them and was a fun book. Our MC is Nita from the land of Caldera. She's from the upper crust of society, her parents and siblings all artists as expected from a society that values art more than most other things. Nita however chooses to work in the steam tunnels fixing boilers and pipes that keep their land supplied with power. Her land chose a number of generations before to close itself off from the outside world and one day Nita after work, she's invited by a coworker and friend to trade with some smugglers from far away. When she learns that there's a medicine that can cure her ailing mother (a disease that is fatal in Caldera), her rather impetuous nature takes over and she decides that she must be present when trading for it. Once on board the airship she's told she'll have to work and prove that she isn't a burden because she'll be with them for a month. During their journey they are attacked by an assortment of little ships and some damage is taken. Letting the Captain know that with her job in the steam tunnels and the fact that she's brought along her tools, she can fix the boiler which is overly complex as well as some other things. She's told that under no circumstances is she to perform any repairs because the people they trade with are the only ones allowed to fix the ship. Upon hearing the journey will take an additional month because of the damage, she chooses to fix something and then hide what she'd fixed only to be found out when the ship goes in for repair. Now at this point when she attempts to trade it's pointed out that not only do they know she tinkered with the ship, but that they wouldn't have traded anyway because there is no need for continued trade. The Captain is forced to pay a 'fee' for her deceit and then Nita points out the obvious too him. I won't mention it here as a spoiler, but you'll know it when it comes. You'll likely know it long before it comes. Free-Wrench is a relatively short but enjoyable story set in a world of steampunk airships, bandits and mysterious fog. A great calamity smothered the world in a toxic fog. The islands of Caldera are one of the last remnants of beauty left and the inhabitants want to keep the grim world out through a closed border policy. We follow the story of Nita. Her family is wealthy, famous and powerful. Most of them are accomplished artists or sculptors, but Nita has always had an interest in machinery an Free-Wrench is a relatively short but enjoyable story set in a world of steampunk airships, bandits and mysterious fog. A great calamity smothered the world in a toxic fog. The islands of Caldera are one of the last remnants of beauty left and the inhabitants want to keep the grim world out through a closed border policy. We follow the story of Nita. Her family is wealthy, famous and powerful. Most of them are accomplished artists or sculptors, but Nita has always had an interest in machinery and engineering. Nita's mother is sick with a disease that cannot be treated in Caldera. Once a renowned sculpturer, the illness left her hands trembling. It's only a matter of time before the disease takes her life. Through a work colleague, Nita learns of black market trade ships that, at a price, could find the medicine that would cure her mother's illness. Most of the story is spent on a decrepit but wondrous steam-powered airship called The Windbreaker. On a mission to save her mother, Nita must step aboard the airship and come along for the journey. Here we meet the quirky and loveable crew of the ship. The author did a great job of bringing these eccentric characters to life through their dialogue with one another and I quickly grew attached to them. Each character has their own unique personality and theme. Gunner likes salvaging and using weapons and the ship's captain seems hard at first but underneath that tough exterior, he really cares for the wellbeing of his crew. Life on the ship is a constant struggle in this bleak world. But it's also incredibly exciting and the outside world is full of new dangers. Free-Wrench is full of adventure, fun characters and wacky machinery, gadgets and weapons. On their journey, they will encounter bandits piloting marvellous flying contraptions, see the world outside Caldera for the first time and deal with the "fug folk" - peculiar creatures adapted to survive in the fog who seem to have a very strong hold on technology and trade in the rim. Apparently a NaNoWriMo project, and it shows. Could have used a good beta read - there were a lot of passages where I simply couldn't picture what Lallo was describing. He clearly envisaged it really clearly himself, but couldn't express it. That's not to say he's a bad writer, he's OK if a little lackluster. Plot was decent, if not not stellar. However, I wasn't a fan of the hurried wrapping up of lingering issues in the epilogue. However, there's plenty to like. Very unusual and memorable worldbu Apparently a NaNoWriMo project, and it shows. Could have used a good beta read - there were a lot of passages where I simply couldn't picture what Lallo was describing. He clearly envisaged it really clearly himself, but couldn't express it. However, there's plenty to like. Very unusual and memorable worldbuilding that felt very plausible. MC comes from a race that's described consistently with them being black, but none of the cringey cliches writers often use when describing black people (well done, Lallo). Characterisation was a little less than three-dimensional, but the main cast is sympathetic and likeable. Includes a female character (Lil) who is in touch with her femininity ("Please can I have some dresses?") and yet bold, full-on, and very physical (making dangerous leaps to catch dangling ropes etc.) If there's one thing Lallo can do well, it's writing women as individuals. This review originally posted on Books in the Garden. I really liked Nita. Impulsive, somewhat-misfit Nita, who appreciates the inner workings of things more than she cares about their aesthetics. I loved how she could be impulsive, and focused, and selfish, even if it was in the pursuit of something rather selfless. The secondary characters were all fun, too. Each with their own unique story and personality. They were half the fun! I also very much enjoyed the steampunk aspects of the book, and re This review originally posted on Books in the Garden. I also very much enjoyed the steampunk aspects of the book, and really enjoyed how it was not only an aesthetic for the story but also a key component. One thing I might have liked to see more of is Nita’s relationships with family and friends on Caldera. But I understand how that would have slowed down the story, and there *are* still two more books. --Audiobook specific-I didn't like the narrator at first but she grew on me quickly. Nita is a talented engineer, working as a contractor – or ‘Free-Wrench’ in a steam works. She is talented, and tough. She is also from a privelged family full of creativity and imagination in a society that values artistic talents. Her calling makes her the black sheep, but she is true to what makes her happy and refuses to be defined by the expectations of others. There is however, one dark cloud to her happiness; her mother is deathly ill. Stalwart though her mother is at the prognosis, Nita wo Nita is a talented engineer, working as a contractor – or ‘Free-Wrench’ in a steam works. She is talented, and tough. She is also from a privelged family full of creativity and imagination in a society that values artistic talents. Her calling makes her the black sheep, but she is true to what makes her happy and refuses to be defined by the expectations of others. There is however, one dark cloud to her happiness; her mother is deathly ill. Stalwart though her mother is at the prognosis, Nita would do anything to help her. Including venturing outside their isolationist homeland to search for a cure in the wider world. Cue adventure and a whole host of beautifully drawn characters. Steam-Punk fantasy at its best, I enjoyed every page of this book. Rating 8/10: perfect to take you away from the diminishing summer in a warm tub on a cold September night. Take one step back, two steps to the left then tilt your head so your left ear is facing the floor and turn rapidly to the right two full turns with your eyes closed. Now you are ready to enter Mr. Lallo's Free-Wrench universe. This is a fun read. A little wacky, but fun. Were I to bet, I'd bet Mr. Llamo was left handed. His invention of a Monkey-Toe is brilliant, what a usefully tool. if it was possible to award six stars I would do it in a heart beat. I have read a lot of steampunk books and this one is easily my favourite. The observation that it is like a steampunk version of firefly is a pretty reasonable comparison. A ragtag crew of misfits aiming to misbehave. The female lead is a wonderfully strong character. I can't wait to get my teeth into the next one in the series. Listen up, I'm on holiday, so will make this short. I thoroughly enjoyed this all action book, so much so that I purchased the second in the series. Finally I would recommend 'Free-Wrench' to family and friends alike. That completes my obligatory review. - Now back to my chill out vacation. I picked up this book from iTunes because it was free and I needed something to read while working out. I was pleasantly surprised at how good this book was. Not too technical, good character development, decent action. I'd recommended this book if you're looking for an easy entertaining read. I enjoyed it so much that I just picked up book 2. Great entry by Lallo into the steampunk world. I like that he has a nuanced fantasy take on it that involves -- at least so far as I can tell -- a different world than our own. I attacked this book like the Fuggers were going after Windbreaker! I devoured it. Good length, but concisely told a good story. Can't wait to try the rest in the series. Began life as a NaNoWriMo project and occasionally shows it with some rough spots here and there, but this is overall a fun steampunkish romp involving vagabond airship crew and a malevolent race whose physical description puts me in mind of the Child Catcher from Chitty Chitty Bang Bang. Easy to read and enjoyable, but for a short, introductory book some bits went on too long I think. Ended feeling like I hadn’t got into it enough, but maybe that’s the trick to make you carry on!